Rising Tide Vancouver Coast Salish Territories opposes the recent attacks on the people of Gaza and the ongoing military occupation of Palestinian Territories. Rising Tide has been working with Indigenous peoples on Turtle Island, opposing land grabs and resource exploitation by industries and state sanctioned institutions. One of those institutions has been, and continues to be, imperial militaries which destroy communities, the environment, and the climate. We reject the Israeli military's attacks on the Palestinian people in Gaza, and the worldwide state powers which respond with complacency. We reject the state powers which support the Israeli military with monetary contributions and weapons such as drones and missiles. We reject Canada's negotiating with Israel for the sake of trade and further development of energy resources. As many regions of the world have tar sands resources, including the occupied Palestinian territories, we extend our solidarity with all who are impacted by resource extraction processes, and encroachments on their sovereignty and self-determination. We reject the mainstream media's coverage (and lack of coverage) of what is happening and the demonizing of the Palestinian people as terrorists. We reject the Western mainstream media's ongoing failure to cover the struggle of the Palestinian people as a struggle for freedom and self-determination. politically. We will not stay silent as the state and corporations contribute to attacks on communities both here and abroad. forced displacement and the number of climate refugees hoping to seek access to food, water, and homes elsewhere. 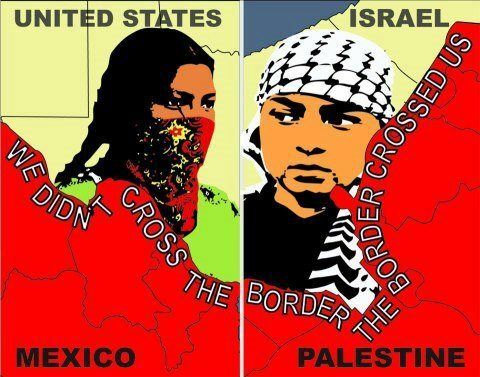 to end the illegal occupation of their land.